Take the music home: Purchase the 1998 CD, "Memories of Scottish Weekend" and/or "More Memories of Scottish Weekend," from 2002. CDs may be purchased at Scottish Weekend! Since 1989 Scottish country dancers and musicians have gathered in the fall for a weekend of dancing in the DC/Philadelphia area. At the request of many participants, the Scottish Weekend committee decided to produce this souvenir CD. The committee wishes to give special thanks to the musicians and engineers for creating such a fine recording of our 1998 ball and is also grateful to the volunteers, composers, and financial backers who made production and distribution of the CD possible. The staff musicians perform together in various combinations from time to time, so the unique Scottish Weekend 1998 ensemble has a cohesiveness and tight delivery seldom found in an informal band. Members of the ensemble are Liz Donaldson, Earl Gaddis, Ralph Gordon, Steve Hickman, Anne Hooper, Calum MacKinnon, and Marty Taylor. Piper Dan Emery joins them on track 4. Track 7 is a performance by the 1998 music class with pianist Dave Wiesler and some members of the ensemble under the direction of Calum MacKinnon. The waltz Lullaby for Kim is dedicated in loving memory to the late Kim McGarrity, founder and director of the Scottish country dance band "Fiddlesticks and Ivory." Arrangements are by Liz Donaldson except track 7 which is by Calum MacKinnon. This magnificent live recording captures the spirit and excitement of the Scottish Weekend 1998 ball at Camp Ramblewood, MD. Recorded and mastered by Flawn Williams. Duplicated by Oasis. Artistic Director Liz Donaldson. Producer Marty King. 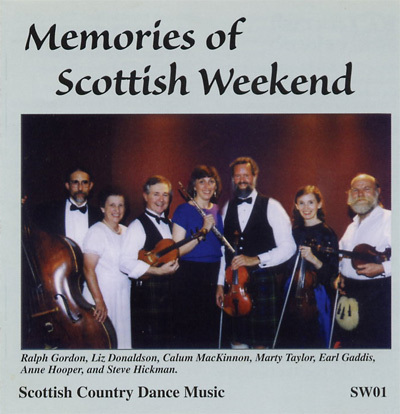 The Scottish Weekend Ball at Camp Ramblewood, Darlington, MD, recorded live September 26, 1998. Recorded by Flawn Williams. Duplication by Oasis. Artistic direction by Liz Donaldson. Additional thanks to Mary Andrews, Elke Baker, Ralph Gordon, Jill Emery/b&w photo, SueEllen Lawton, Ned Leight/color photos, and LISS Productions. $15 plus $2.50 shipping each; or 2 for $25 plus $3.00 shipping. To order, send check payable to Scottish Weekend, Inc. to: Scottish Weekend, Inc. Note: You may combine orders for "More Memories of Scottish Weekend" and "Memories of Scottish Weekend". For example, the total for one each is $28.00 (2 for $25 plus $3.00 shipping/handling). Visit CD Baby to order this CD on-line or listen to samples from each track.